Concrete Cleaner - Super Concrete Renovator From SureCrete	Concrete Cleaner from SureCre..
60 Oz Pail CounterTop Slurry Mix (3.5 lbs)Concrete countertop slurry quickly fills holes, voids and .. Deep Patch From SureCreteDeep Patch is a single component, just add water, cement based chemical pa.. Flash Patch - Fast setting thin concrete repairConcrete Patching - Flash Patch is a single componen.. 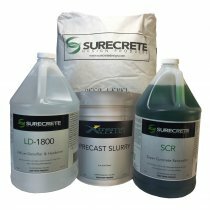 Concrete Surface Delay from SureCrete Design Surface Delay or Surface Retarder is a transparent.. CONCRETE BONDING AGENT FOR OVERLAYS – SUREBOND	SureCrete’s SureBond is a single compone.. CONCRETE LITHIUM DENSIFIER/HARDENER– LD1800	Concrete surface preparation	SureCrete’s LD1800 concret..
Fast Strip Plus - Solvent Based Concrete Sealer Remover and Coating Stripper From SureCreteO..
EnviroStrip by SureCrete is an acrylic sealer stripper Removes any acrylic coatings o..
ElastoShield by SureCrete is a ready-to-use concrete waterproofing and cracks ..